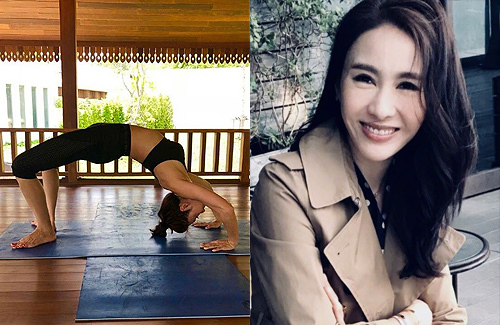 Gigi Lai (黎姿) is known for her ageless beauty and glowing complexion. The 47-year-old former actress is now CEO of a public beauty corporation with assets worth over $100 million HKD. Also a busy mother of three girls, Gigi makes sure to take time out for herself. Detoxing and practicing yoga have become important parts of Gigi’s wellness routine. Uploading several photos of herself in yoga poses on social media, Gigi wrote, “Exercise and sweating are the best ways to de-stress!” She also advises women to eat a nutritional breakfast so they have energy to kickstart their busy day. Fans praised Gigi’s fit figure and flexibility. One netizen wrote, “Wow, Gigi’s leg is so straight!” Another long-time fan even found a photo of Gigi in a yoga pose in the TVB drama Healing Hands 3 <妙手仁心III>. It is hard to imagine that 13 years have passed, but Gigi nearly still looks the same.